"To an average American who witnesses the dismal spectacle of the narcotics traffic at the street level, it must seem inconceivable that the government could be implicated in the international drug trade. 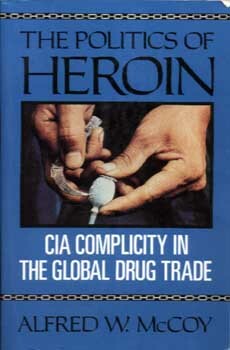 Unfortunately, American diplomats and CIA agents have been involved in the narcotics traffic at three levels: 1) coincidental complicity by allying with groups actively engaged in the drug traffic; 2) support of the traffic by covering up for known heroin traffickers and condoning their involvement; and 3) active engagement in the transport of opium and heroin. It is ironic, to say the least, that America's heroin plague is of its own making." Twenty years of research have led to this revised and updated edition of Alfred W. McCoy's classic, The politics of Heroin in Southeast Asia. In it, he concludes that, with global production and consumption of narcotics at record levels and heroin use in America on the rise, it is time to confront the failure of the U.S. government's drug policy and to put an end to the CIA's complicity in the narcotics trade, which since World War II has been an integral part of the agency's efforts to maintain U.S. power abroad. A remarkable expose of official U.S. hypocrisy in its approaches to one of the world's greatest social problems, The Politics of Heroin offers an analysis that is destined to influence the public debate on drugs for years to come. Alfred W. McCoy is professor of Southeast Asian history at the University of Wisconsin-Madison.